Biggest likes to watch those YouTube videos. If you have a child aged 2-8, you probably know the ones. They involve blind bags and surprise eggs and Play Doh and glitter slime. And your child will be endlessly fascinated with watching them on repeat until you lose the will to live. 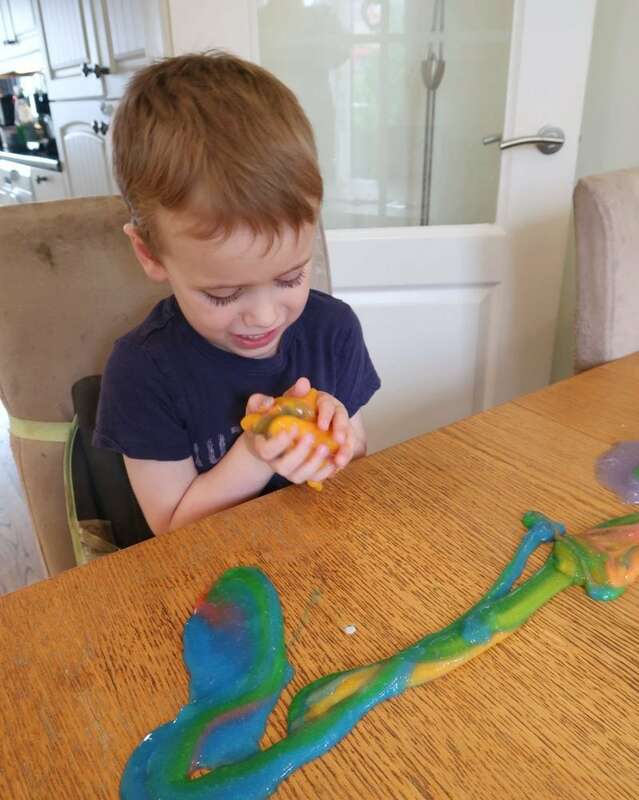 Biggest has been particularly obsessed with one involving slime for the last few weeks and he has begged me to make some for him. 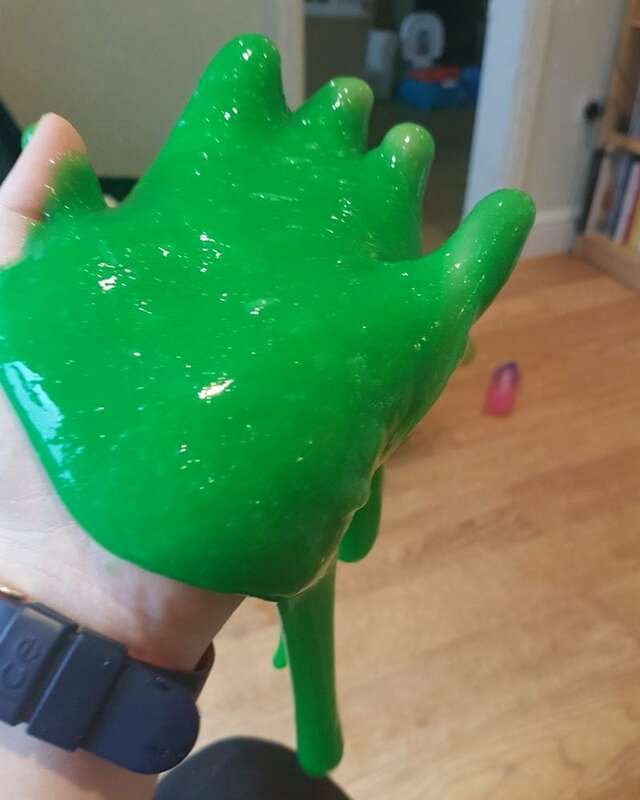 This week, I finally gave in and I have sourced a UK slime recipe to share. Our Recipe is loosely based on this one from Do It, Gurl but we used starch to make the recipe UK friendly and I found the amounts needed a little adjustment. 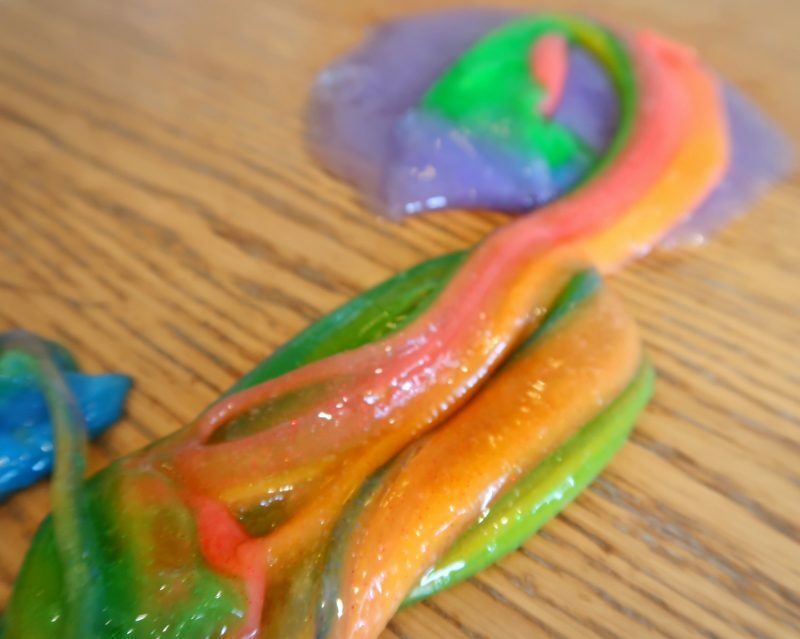 We spent a very happy few hours making and playing with our slime. 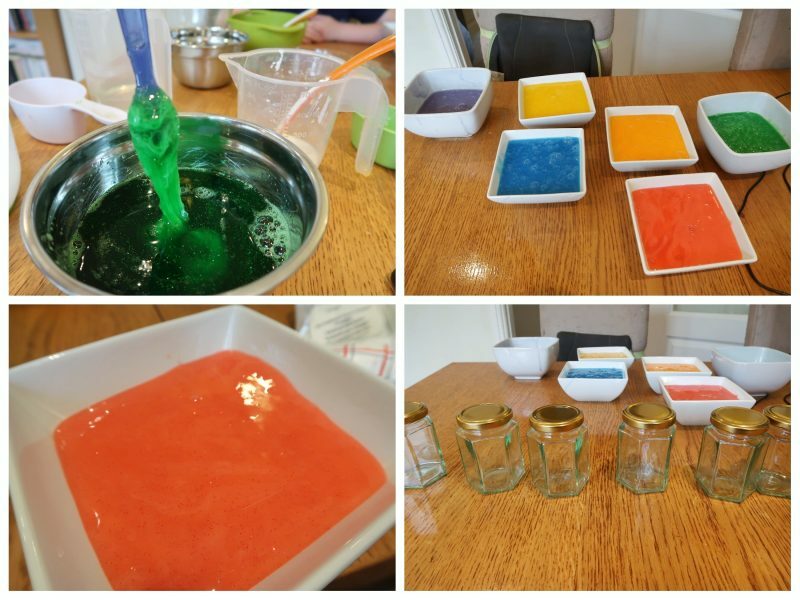 150mls of clear glue per batch of slime (We made 6 colours and so we used 900 mls of glue. 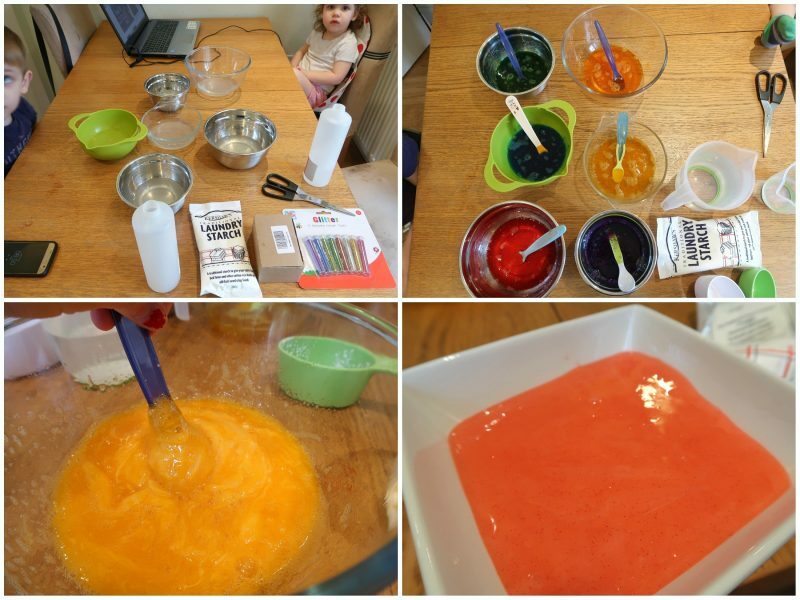 Firstly, measure out 150 mls of glue into each bowl for each colour of slime that you would like to make. 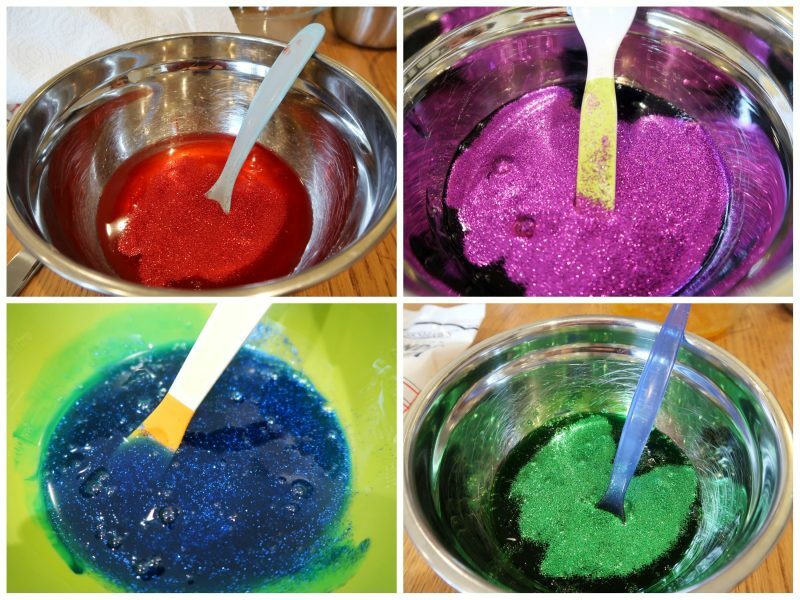 Then, add the food colouring and glitter. You only need a drop or two of gel colour. Next, add 200mls of warm water to each batch of glue. 3. The next stage is the tricky part. Firstly, make up a jug of starch mixed with water. 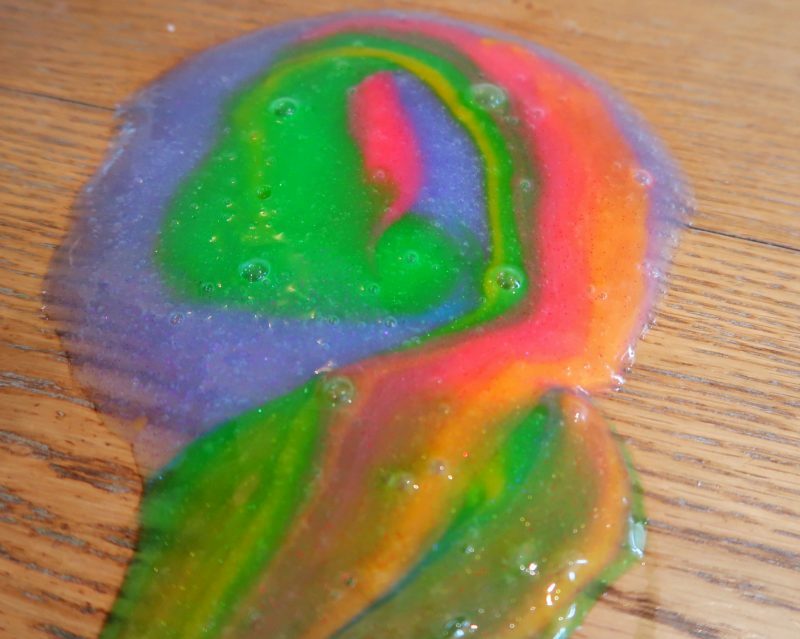 You will need very roughly 40-80 g of starch per batch of slime. Mix the starch with water. The recipe from Do it, Gurl suggested equal parts starch and water, but I found it needed to be more diluted than this for our UK slime recipe. I used roughly two parts water to one part starch. 4. Pour the starch mixture, very slowly, into the glue, stirring as you go. The mixture will get white ‘strings’ in it and appear to go lumpy. This is fine and perfectly right. 5. Keep stirring and adding the starch mixture until a ‘ball’ of white stringy stuff starts to form. At this point, it is best to get in with your hands and start kneading and manipulating the glue with your hands until it comes together. 6. Eventually, the white lumps and string-like texture will disappear and you will be left with smooth slime. The more starch you add, the firmer the final slime will be. I found it quite a difficult to strike a balance and so I would suggest adding the starch mixture very slowly. 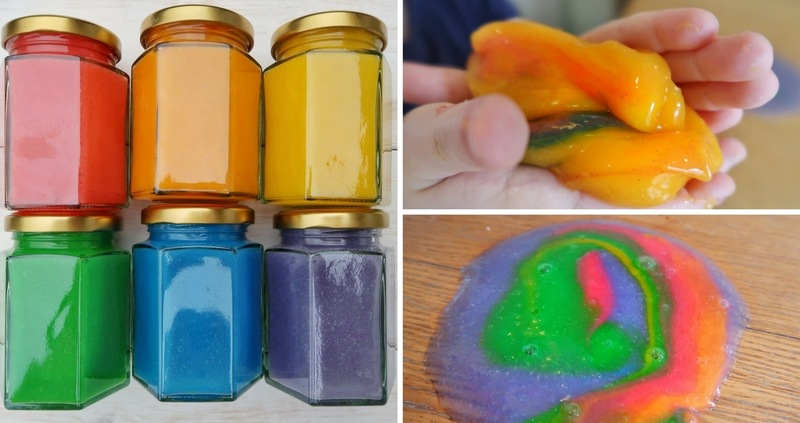 Then repeat the steps for each colour of slime. 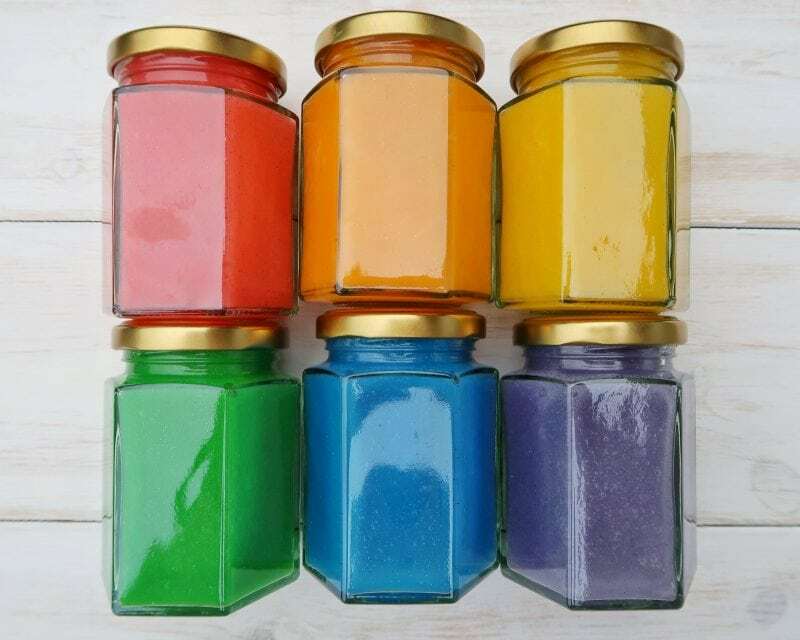 I made six batches – red, orange, yellow, green, blue and purple. 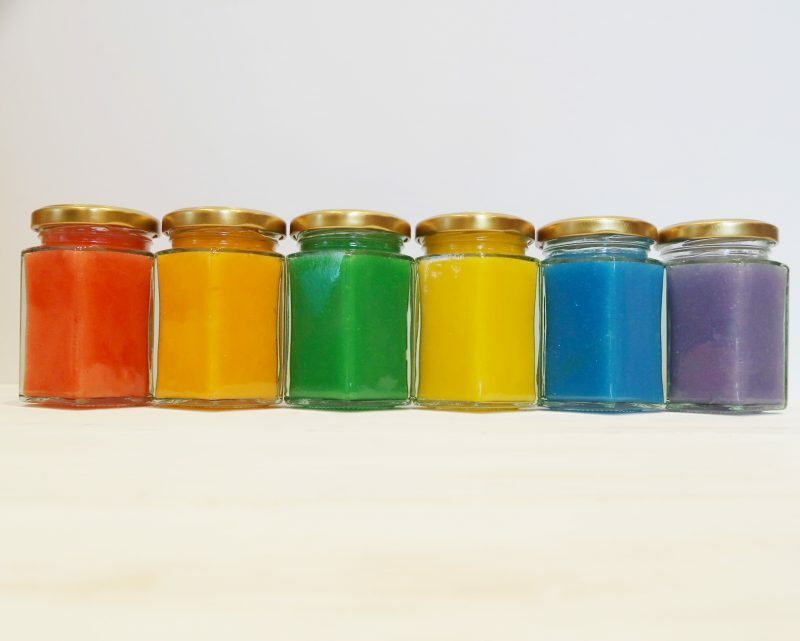 In addition, I chose to separate some of my slime out into jars, in order to use later. It requires quite a bit of time and effort to get the full spectrum of colours and enough slime to have a complete rainbow and so I wanted to be able to use it more than once. I know the green is in the wrong place. This pains me deeply. This kept the children occupied for ages. 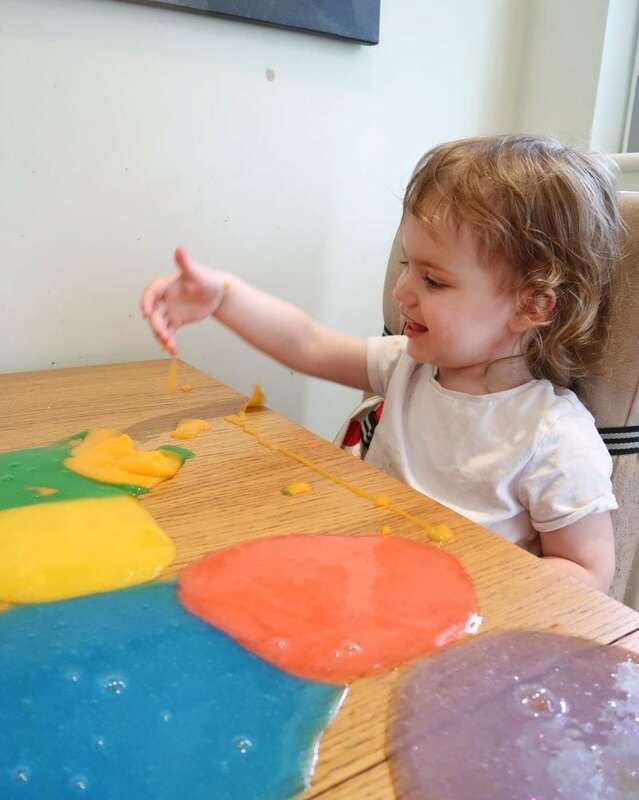 We spent a good 45 minutes to an hour playing with our slime and we also have half left over to play with on another day. 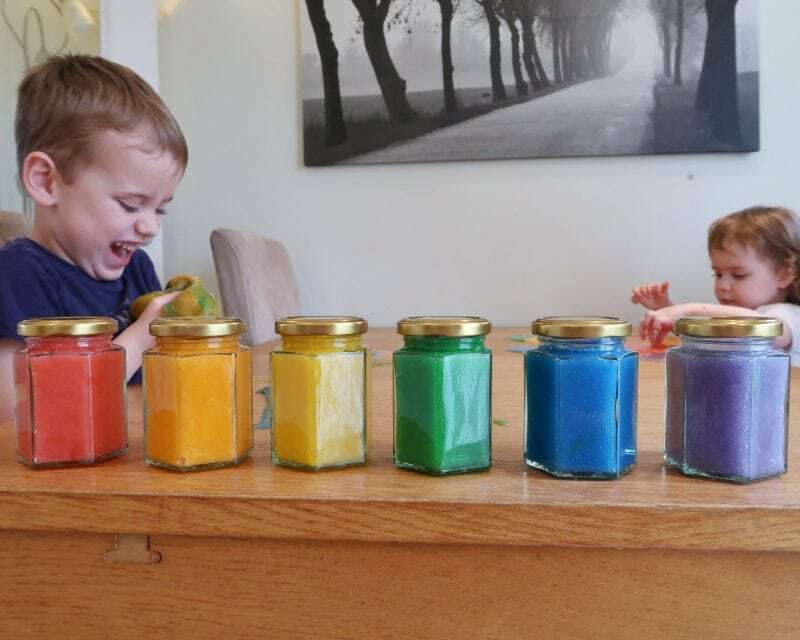 You can see the wonder and excitement it generated from Biggest and Littlest in the pictures above. Making the six different colours was definitely worth the effort. 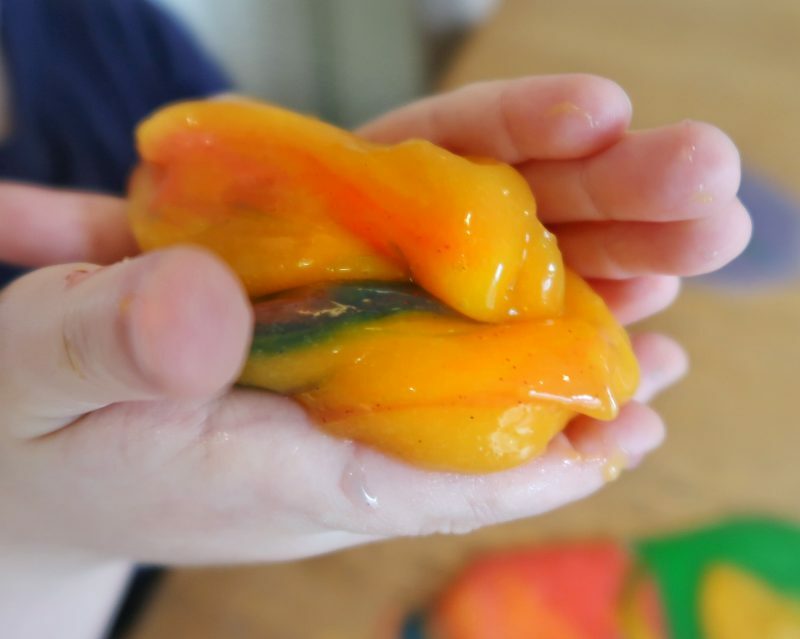 And, if you want a slightly less ambitious activity, making one batch of slime in a colour of your choice really will take only minutes. Finally, I have since washed the clothes the children wore while they were playing with the slime and I can confirm it all washed out easily. Though, the clothes were a little stiffer than usual and I suspect that is due to the starch! We used Amazon Associates affiliate links in this post and they are for the exact items that we used.